Zoom into Markarian 177 and SDSS1133 and see how they compare with a simulated galaxy collision. When the central black holes in these galaxies combine, a "kick" launches the merged black hole on a wide orbit taking it far from the galaxy's core. The dwarf galaxy Markarian 177 (center) and its unusual source SDSS1133 (blue) lie 90 million light-years away. The galaxies are located in the bowl of the Big Dipper, a well-known star pattern in the constellation Ursa Major. The object's curious properties make it a good match for a supermassive black hole ejected from its home galaxy after merging with another giant black hole, but astronomers can't yet rule out an alternative possibility. The source, called SDSS1133, may be the remnant of a massive star that erupted for a record period of time before destroying itself in a supernova explosion. "With the data we have in hand, we can't yet distinguish between these two scenarios," said lead researcher Michael Koss, an astronomer at ETH Zurich, the Swiss Federal Institute of Technology. "One exciting discovery made with NASA's Swift is that the brightness of SDSS1133 has changed little in optical or ultraviolet light for a decade, which is not something typically seen in a young supernova remnant." 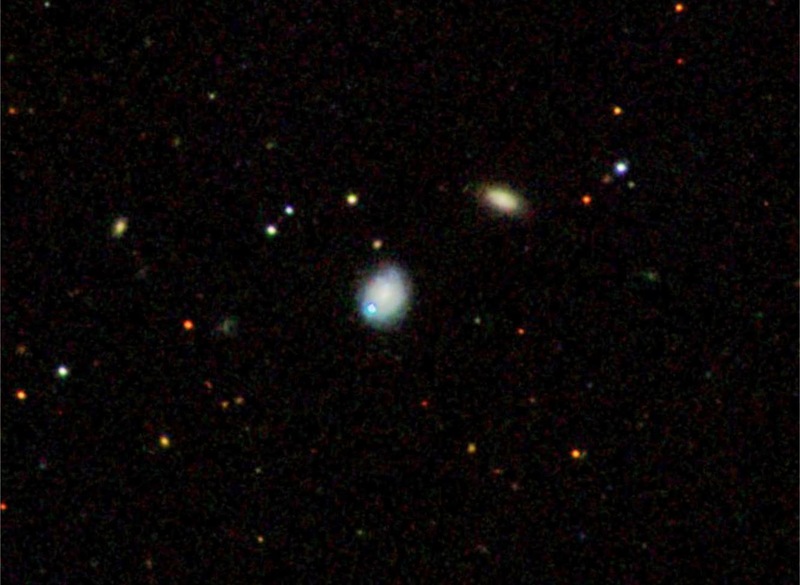 Using the Keck II telescope in Hawaii, researchers obtained high-resolution images of Markarian 177 and SDSS1133 using a near-infrared filter. Twin bright spots in the galaxy's center are consistent with recent star formation, a disturbance that hints this galaxy may have merged with another. Credit: W. M. Keck Observatory/M. Koss (ETH Zurich) et al. In a study published in the Nov. 21 edition of Monthly Notices of the Royal Astronomical Society ("SDSS1133: an unusually persistent transient in a nearby dwarf galaxy"), Koss and his colleagues report that the source has brightened significantly in visible light during the past six months, a trend that, if maintained, would bolster the black hole interpretation. To analyze the object in greater detail, the team is planning ultraviolet observations with the Cosmic Origins Spectrograph (COS) aboard the Hubble Space Telescope in October 2015. Whatever SDSS1133 is, it's persistent. The team was able to detect it in astronomical surveys dating back more than 60 years. The mystery object is part of the dwarf galaxy Markarian 177, located in the bowl of the Big Dipper, a well-known star pattern within the constellation Ursa Major. Although supermassive black holes usually occupy galactic centers, SDSS1133 is located at least 2,600 light-years from its host galaxy's core. 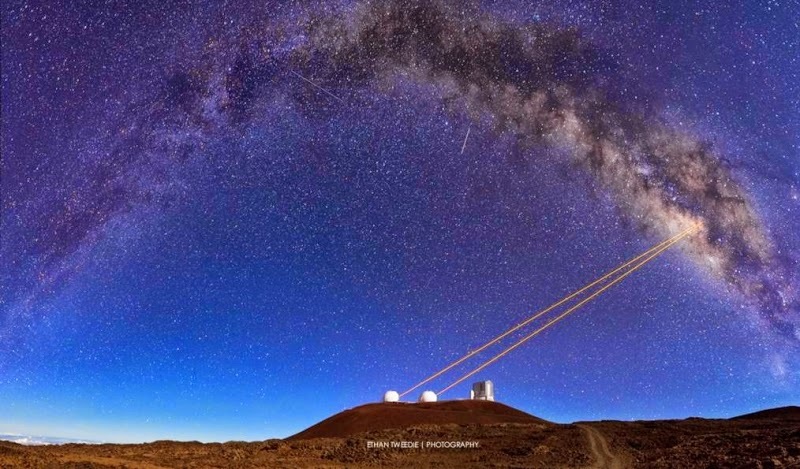 In June 2013, the researchers obtained high-resolution near-infrared images of the object using the 10-meter Keck II telescope at the W. M. Keck Observatory in Hawaii. 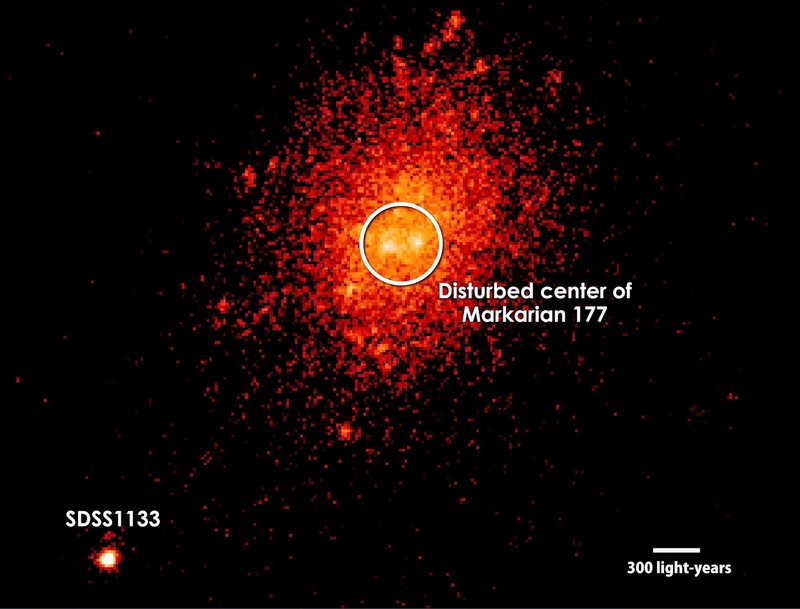 They reveal the emitting region of SDSS1133 is less than 40 light-years across and that the center of Markarian 177 shows evidence of intense star formation and other features indicating a recent disturbance. 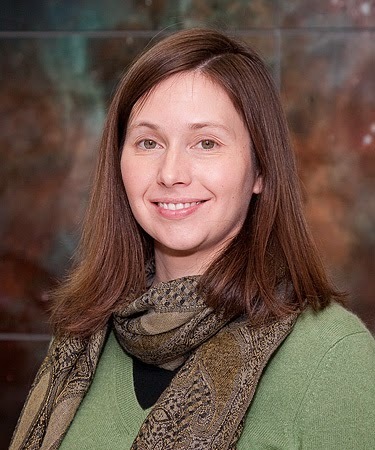 "We suspect we're seeing the aftermath of a merger of two small galaxies and their central black holes," said co-author Laura Blecha, an Einstein Fellow in the University of Maryland's Department of Astronomy and a leading theorist in simulating recoils, or "kicks," in merging black holes. "Astronomers searching for recoiling black holes have been unable to confirm a detection, so finding even one of these sources would be a major discovery." The collision and merger of two galaxies disrupts their shapes and results in new episodes of star formation. If each galaxy possesses a central supermassive black hole, they will form a bound binary pair at the center of the merged galaxy before ultimately coalescing themselves. ESA Rosetta Mission: Philae Lander - Game Over!